Is America’s great love affair with Tom Cruise over? If you look at the numbers then you might be inclined to say ‘yes’. 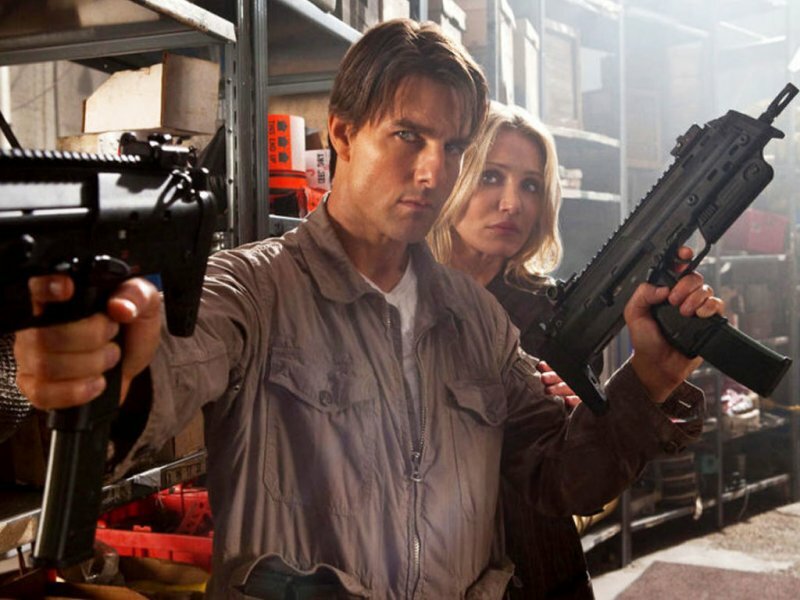 KNIGHT AND DAY took in nowhere near as much as a Tom Cruise starring movie is supposed to make. And especially when he’s teamed with Cameron Diaz who has that wonderful grin that somehow manages to be both gorgeous and goofy at the same time. And both Tom Cruise and Cameron Diaz know how to play comedy and action well so what happened with this movie? Was it because it hit the theaters at around the same time as “Killers” starring Ashton Kutcher and Catherine Heigl which was a movie that in the trailers looked extraordinarily similar to KNIGHT AND DAY? Or is that the audience who grew up with Tom Cruise in the 80’s and 90’s have moved on and just don’t want to see him on screen anymore? June Havens (Cameron Diaz) is trying to get back home to Boston in time to attend her sister’s wedding. And she keeps bumping into this cute guy with a really engaging grin who introduces himself as Roy Miller (Tom Cruise) who hints that maybe she really shouldn’t get on the same flight with him. But she’s got a pesky dress fitting she can’t miss and so she gets on the plane. It never occurs to June to wonder why a flight she was told was overbooked not more than twenty minutes ago is now almost empty except for herself, Roy, the flight crew and half a dozen men who look as if they are not casual travelers. It isn’t long before the men and the flight crew are revealed to be assassins after Roy. In between killing them all and steering the plane to a crash landing, Roy explains that they were sent by his ex-partner Fitz (Peter Saarsgard) who has gone rogue. Fitz is after The Zephyr, a perpetual energy battery. Roy has The Zephyr and he’s trying to rescue Simon Feck (Royal Dano) the eccentric genius who created/invented The Zephyr. The situation is complicated because Fitz has convinced his boss (Viola Davis) that it is Roy who’s the rogue and so Roy is on the run from both the bad guys and the good guys. Roy gets June to Boston and she tries to resume her life but that’s impossible as Roy re-enters her life in spectacularly explosive fashion, rescuing her from CIA hit squads as well as hit men working for the world’s most dangerous arms dealer, Antonio Quintana (Jordi Molla). And the two of them are off on a world-wide chase to save Simon, keep The Zephyr out of Fitz’s hands and clear Roy’s name. I really wasn’t all that hot to see KNIGHT AND DAY in the theaters. Not because I dislike Tom Cruise, who I think is actually a pretty good actor but it looked like just another summer action flick with heaping helpings of comedy and romance thrown into the mix. And that is precisely what it is. 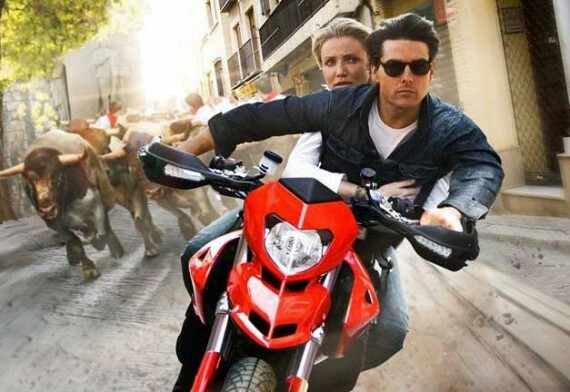 There’s nothing deep or innovative or even exceptional about KNIGHT AND DAY. I suspect that it got made simply because Cruise and Diaz wanted to work together and Cruise wanted to make a light action movie after the heavy drama of “Valkyrie”. Tom Cruise doesn’t even try to stretch his acting muscles in this one. He falls back on his tried and true standards: smiles and charm. And really, there’s nothing more he needs in a movie or in a role like this. Cameron Diaz gets to do a little bit more with her character development during the course of the movie in a satisfying manner. Their scenes together are full of cuteness and fun. Even when they’re being shot at by a dozen guys with machine guns they manage to say cute fun things. It’s that kind of movie. There’s a nice little mysterious subplot involving an elderly couple Roy is keeping tabs on via a hand held device and the supporting actors go about their business competently and with skill. 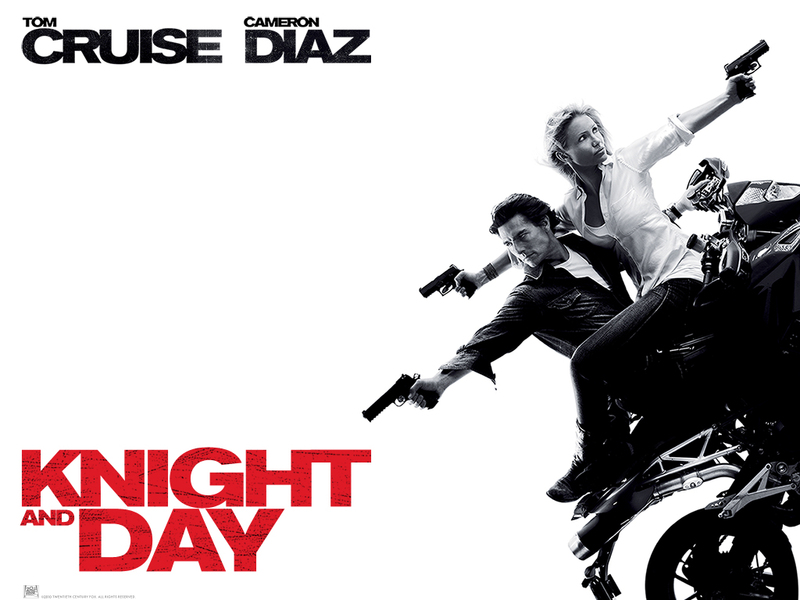 As with “3:10 To Yuma” and in KNIGHT AND DAY he demonstrates that he’s a terrific action director. I’d love to see him tackle a James Bond film someday. He knows how to keep the story moving so that we know who’s doing what and why. And he understands that in the slam bang fight scenes it’s important that the audience be able to see who’s hitting who. No shaky cam here. There’s a number of impressive shootouts and chases including one that takes place during The Running of The Bulls in Pamplona that I really enjoyed. So should you see KNIGHT AND DAY? It’s by no means at all a Must See Movie unless you’re a confirmed Tom Cruise or Cameron Diaz fan. In which case you’ll probably seen it already. Let me put it this way: I get emails from people all the time telling me I’m too hard on movies. They say that they just want to turn off their brains and be entertained. Well, here’s a movie that’s perfectly made for that purpose. And it happened to catch me on a night when that’s all I wanted. Your mileage may vary. I liked this one just fine. You and me both. I wouldn’t say it’s one of the better movies that either Cruise or Diaz has made but it’s an absolutely solid B-level action picture, just right for Friday or Saturday night viewing.